How to finance an expedition. Shackleton (1874-1922) succeeded at all the above. Not all expeditions and books are huge money-makers, but staying alive is a prize. There are many amazing stories of raising expedition funds. A commonality is donations of food. I had to laugh outloud when I read in Robert Swan’s book Antarctica 2041 A Quest to Save Antarctica (Random House, 2010) that some of the first hard-won sponsorship Ernest Shackleton got for his early century Antarctic expeditions (Discovery, Nimrod, Endurance) was foodstuffs. 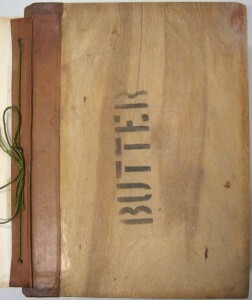 Stores taken to Cape Royd, BAE 1907-1907 from The Heart of the Antarctic, photographs and manuscript diaries held by La Trobe Library, Melbourne, and by the Scott Polar Research Institute, UK. What is ironically or beautifully funny is our first donation for this book project was Manitou Saskatoon Berry Bison Pemmican. You have to start somewhere. Thank you to Mountain Equipment Co-op. It’s a tasty, practical but also a symbolic donation. 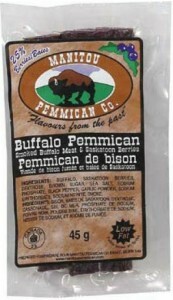 First nations Cree and Sioux made Pemmican. 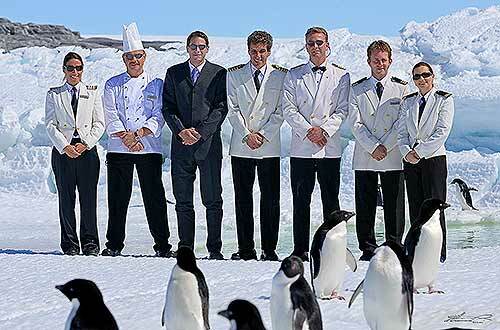 Explorers learned about it in the Arctic and ate it in the Antarctic. Indigenous knowledge like what to eat helps us survive. We served the pemmican with Wendy’s delicious fondue, Maple Borscht soup at the Dec 14 Centenary Party also launching the Antarctic Book of Cooking and Cleaning. Our book-in-the-making ship has sailed. The trek is on, we will get to our destination, envisioning like Shackleton, safe dry land. For the Discovery expedition –science over adventure was its mantra – Shackleton was Third Officer and in charge of holds, stores, provisions and interestingly, entertainment. 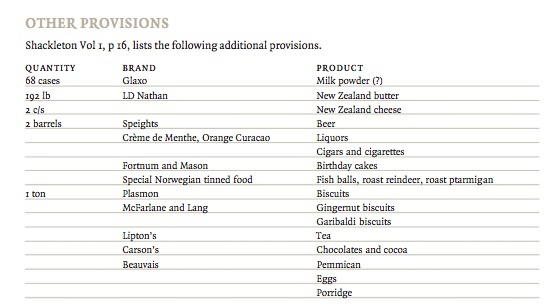 In addition to financing by wealthy individuals, the Discovery had pounds (both kinds) of commercial sponsorship items: Colmans mustard and flour, Cadbury -3,500 lb chocolate, Jaeger discounted clothing, Bird’s baking powders and Bovril beef extract. (Preston, Diana (1999). A First Rate Tragedy: Captain Scott’s Antarctic Expeditions, London: Constable). Robert Swan, OBE, the Fundraising Patron of The Shackleton Foundation who did the ‘In the Footsteps of Scott’, South Pole Expedition in 1986 is also impressive. He raised $5 million from 1000 sponsors (and later did much more, including a substantial clean up project at Bellinghshausen, of late collaborating with the Environmental Services Association of Alberta). Previously Shackleton had been an editor for Scott’s Antarctic newspaper, the South Polar Times. 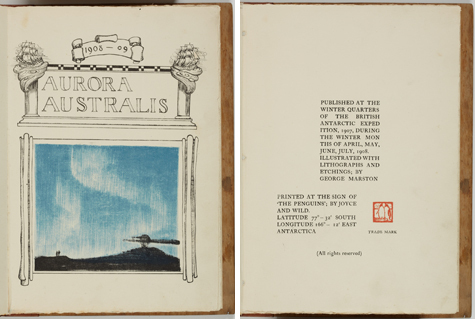 According to Shackleton’s preface to Aurora Australia, this writing endeavour went further: it was the ‘first attempt to print a book and illustrate it in the depth of an Antarctic Winter’. Perhaps his idea to make the first book in Antarctic was directly related by being tasked on the Discovery Expedition to think of entertainment for the team. On Ross Island they made about 100 hand-made books that I’ve mentioned before. 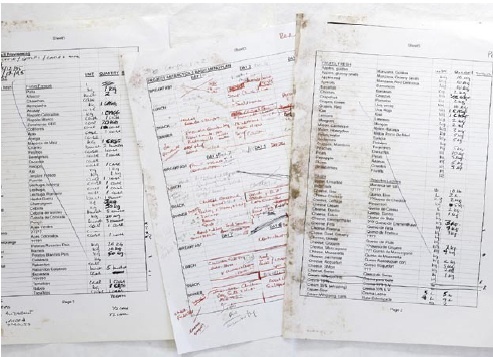 I had the pleasure to see part of one in the as part of the Mapping The Last Continent exhibition at the State Library of New South Wales in Sydney. Apparently about 70 of the original books are unaccounted for. The Guardian UK in 2006 reported that one with the cover from a crate of marmalade jars was unearthed in a stable in Northumberland. It was expected to fetch over 20,000 sterling at auction. Shackleton organized to bring materials to make books to fend off any malaise of the expeditioners and keep their hands and minds busy. They created stunning hand-made books filled with drawings, stories, poetry, scientific facts, even food stories, of course. They were illustrated by George Marston. 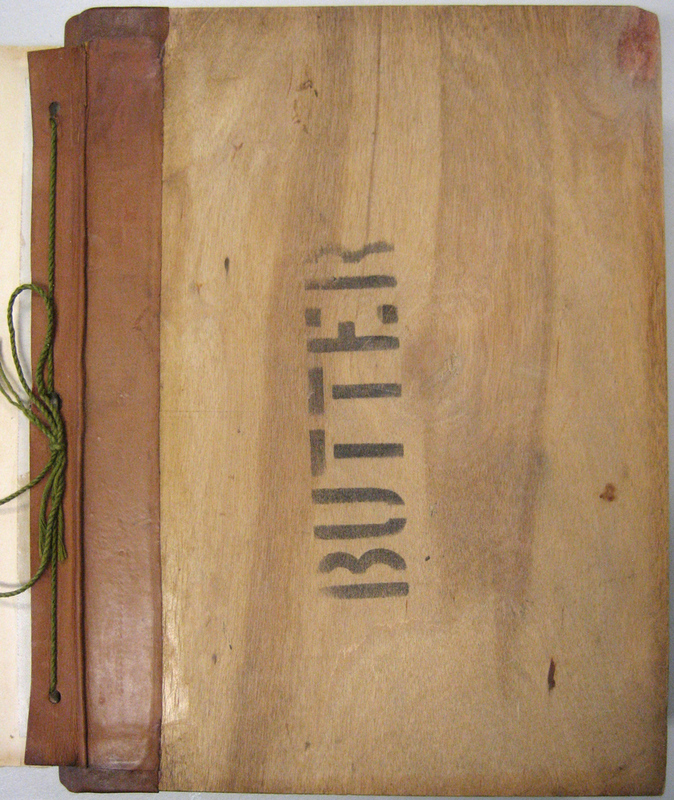 The inside covers were made from the wood of food provision packing crates and the binding with leather from horse harnesses. It wasn’t a moneymaker but a labour of love. It was printed at The Sign of the Penguin, 1908-1908 (Ross Island, Joyce & Wild, 1908). I could go on but this is the short love story of the first Antarctic book. A quote of Shackleton’s that I do appreciate is “Optimism is true moral courage”. But knowing Shackleton’s story, it is not about refusing to take chances or risks: quite the opposite. Weigh options closely when things get rough. And put your people first. Nothing else. The incredible survival story of Shackleton’s and his parties and crew after the loss of their ship the Endurance crushed by pack ice makes my skin tingle. It’s a gorgeous example of human triumph, hope, skill and cooperation in a dangerous time. Sometimes the world feels like we’re in such a dangerous time that looking back to look forward is comforting. I didn’t imagine that learning about Sir Ernest Shackleton’s leadership skills and life could help me imagine how collectively we will grapple with self-immolation and desperation of Tibetans about the situation in Tibet. Or to try to figure out how to go forward to fight an AIDS pandemic that scientists and the global community knows how to tackle but those with decision making power and money gutted the funding to fight it. Furthermore, racism and lack of tolerance for difference rears its head in new landscapes we are still exploring, like Twitter. I called to the other men that the sky was clearing… a moment later I realized that what I had seen was not a rift in the clouds but the white crest of an enormous wave. We have to persevere; we know they got over the wave.